Acoustically shielded, TDH-39, 10-ohm speakers with adjustable headband. 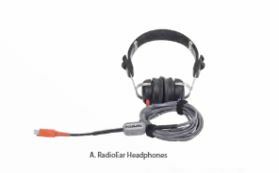 Lightweight headphones not acoustically shielded, recommended for pediatrics and when acoustic shielding is not required. For use with Cadwell EP devices. HDA280 Sennheiser 37-ohm for use with the Sierra Summit.